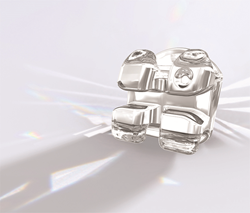 Dentsply Sirona Orthodontics, a division of Dentsply Sirona (NASDAQ: XRAY) announced the introduction of Ovation S clear brackets. Second in hardness only to diamond, the specially formulated ceramic material of Ovation S offers a combination of clarity and strength that traditional ceramics cannot match. The esthetics of Ovation S braces are unique in how the material lets the natural color of the teeth shine through making the brackets all but invisible. Plus, the high-tech finish minimizes the reflection issue that traditional ceramic brackets suffer from while providing a powerful barrier against stains. Manufactured using the latest in ceramic injection molding technology, the unique molecular structure, state-of-the-art finish and triple chamfered slot of Ovation S brackets reduce friction by 41% compared to traditional ceramics. This allows for the smooth, steady movement of archwires without binding or crimping to maximize patient comfort. Because the material that Ovation S brackets are made from is so strong, the brackets can be made smaller and with a lower profile for a more comfortable patient experience. Available in Base and Euro prescriptions in slot sizes .022 and .018 and with hooks on 3, 4 and 5. Ovation S gives clinicians the precision, performance and control that removable solutions can’t match. For more than 50 years, Dentsply Sirona Orthodontics has been shaping the way orthodontics is practiced. From GAC’s flagship In-Ovation line, to force-intuitive wires and GAC Buccal Tubes line, to auxiliary appliances and innovative software programs, Dentsply Sirona Orthodontics remains dedicated to maximizing results while enhancing patient comfort. For more information about Ovation S or any of Dentsply Sirona Orthodontics products, please call 800.645.5530.